The late Joseph Lagana, Sr. started at the inception of the business in 1934, then known as Liberty Auto Stores. As the years progressed, the products gradually evolved from automotive and hardware goods into furniture and electronics. 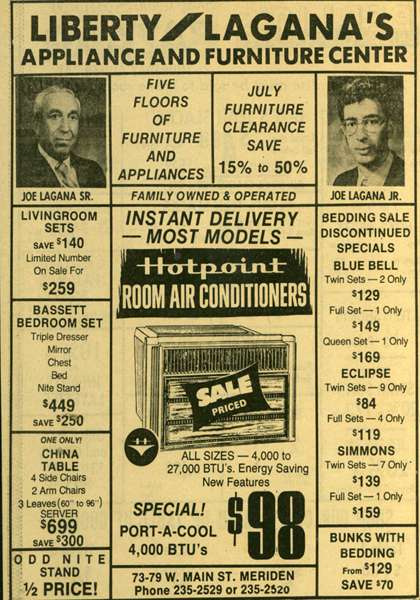 Ownership was transferred from father to son in 1975 as Joseph A. Lagana, Jr. took over the business. Liberty Lagana became a 3rd generation business in 2003 as Matthew G. Lagana joined the company full-time. Joseph retired in 2006 and Matthew became the current owner. In 2007, Liberty Lagana expanded its showroom with an additional 1300 square feet of space. In 2009, Liberty Lagana once again expanded its showroom with even more additional display including leather and sectionals! 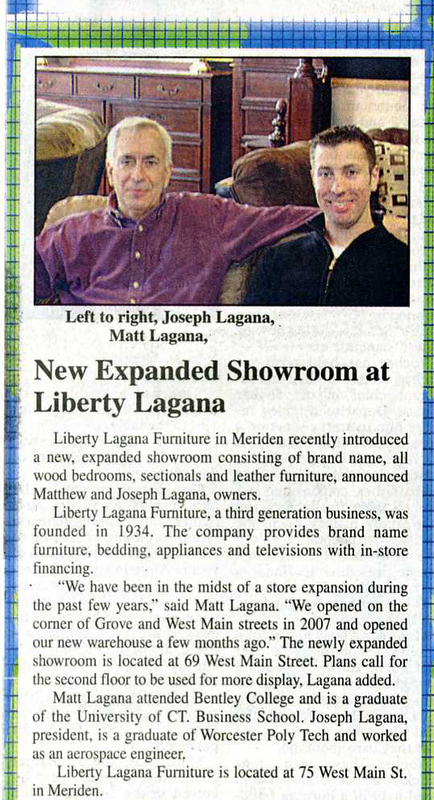 Liberty Lagana once again expanded its showroom in January 2010! The 2nd floor at 75 West Main Street was outfitted with 3500 square feet of more display consisting of youth furniture, formal dining, sleep sofas, and more! We are Connecticut's best kept secret in furniture! We've been serving the area for over 80 years offering the best FACTORY DIRECT prices on top-selling brands like Ashley Furniture, Serta Upholstery, Vaughan-Bassett, Woodcrest, & more! (We're Connecticut's oldest Ashley dealer!) We offer flexible IN-STORE financing, free delivery, and we have a knowledgeable NON-COMMISSIONED sales staff! A great Liberty Lagana article courtesy of MERIDEN PATCH!